I've been craving salty things, despite the fact that I’m surely ingesting several gallons of salty sea water a day. I expected these to taste more like salt and vinegar chips, and was ready to be let down; you'll be pleased to know that they live up to their extreme promise. 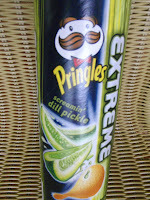 Tangy with lots of dill, they are strangely addictive. I'm picky about my deli meats. I don’t buy cold cuts from the pre-packaged area unless it's some thick sliced bologna wrapped in red paper. My texture issues force me to avoid pressed meats, and even at the deli counter I like things sliced in a particular manner. 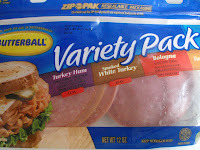 However, I must give credit where it’s due—I just tried the Butterball turkey variety pack, which includes turkey (of course), turkey bologna, turkey salami, and turkey ham. Weird, huh? Sound a little gross? The verdict: it's not too bad. My least favorite of the group is the regular turkey, 'cause like I said, it’s pressed and feels icky in my mouth. As for the rest: the salami was tasty and worthy of a snack; the bologna was especially good; the ham was ok, but best in a sandwich. Makes for a good backup if the deli is closed, and it’s not bad for you because it’s all turkey based. I see these everywhere in stores in St. Thomas and I’ve been curious. It certainly doesn’t sound appealing, a non-alcoholic malted beverage—a beer soda. Consider this a free service to you; I tasted it and now you never have to. Close your eyes and smell the dark brown liquid and you’ll think you just walked into a brewery; keep them closed and take a sip and you’ll think someone shoved your face into the run-off on the brewery floor. It’s disgusting, sickeningly sweet and syrupy, and yet every convenience store and grocer is stocked up on these fizzy, malty beverages. 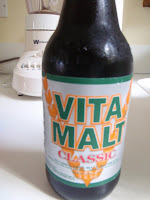 The Vita Malt website (where everyone seems to be having a really good time) says that they're “highly nourishing and energising [sic].” I would much rather just take a multi-vitamin. Ok, it comes in a box shaped like a bus, so you know it can’t be half bad. 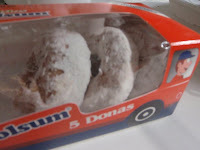 It’s a donut covered in powdered sugar that melts in your mouth. I’m not sure where you can go wrong here, except that they come in boxes of 5, and Beta Wife and I have to duke it out over the last donut.